A heavy heart rate, bounding heart or a rapid heart rate is a serious medical concern. Minimal exertion can sometimes cause a heavy heart rate when you are suffering from an underlying medical condition. 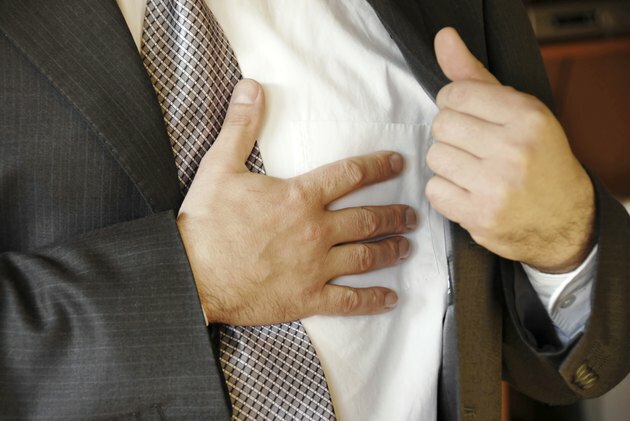 The University of Maryland Medical Center reports that the pulsing veins in your neck can sometimes reveal a heavy heart rate and you may also experience a rapid pulse. A heavy heart rate after doing only minimal activity could be a sign of being out of shape but it can also be a sign of more serious medical conditions such as heart disease, high blood pressure. A heavy heart rate with minimal exertion can also occur as we age and our we develop heart disease. According to the University of Maryland Medical Center, a heavy heart rate can also be caused by a fluid overload in your body such as in kidney failure. If you are suffering from a medical condition that is causing you to have a heavy heart rate then you may also have other symptoms. Some of these other symptoms can include shortness of breath, dizziness, and chest pains, left-sided shoulder pain, neck pain and even throbbing pain in your teeth. To identify the exact cause of your heavy heart rate with minimal exertion your health care provider may do a physical exam followed by a battery of tests. The National Library of Medicine reports that your physician may do a blood count test, chest X-ray, electrocardiogram and an echocardiogram. You should take a heavy heart rate with minimal exertion very seriously because it could be a life threatening medical condition. In fact, Drexel University College of Medicine reports that you should seek prompt medical attention if you experience a sudden or severe, heavy heart rate. Preventing this medical condition may not be possible in some cases because the disease that causes it may be hereditary. Watching what you eat, however, trying to eat healthy foods such as fruits and vegetables is a excellent way to prevent medical conditions such as heart disease and high blood pressure that can lead to this medical condition. In addition, exercising on a regular basis will help you keep blood pressure down and minimize the possibility of heart disease. What Does it Mean When You Almost Pass Out After Heavy Exercise? Does Heavy Exercise Affect Implantation?